When you wake up in the morning, you will have likely gone a full seven to eight hours without a drink of water — maybe even longer if you’re not one to take a few swigs before bed. Realistically, that means we go approximately one-third of the day without drinking any fluids. What’s even worse is that most people do not drink enough water even when they are awake. They’re at work, distracted, chugging back coffee. Considering as many as 75 percent of Americans suffer from chronic dehydration, there are many common symptoms that come with a lack of water consumption. Whether you feel weak, tired, constipated or suffer from headaches, more water could be an easy fix. Today, I want to introduce you to the perks of drinking one liter of water on an empty stomach — which tends to be first thing in the morning. When you think of “therapy,” drinking water may not come to mind. However, for those who do not drink enough water on a daily basis, you will be amazed at how much better you can feel. Being an essential, basic element, you should be drinking an average of eight to ten cups every day. In today’s modern society, it is believed that many ailments begin with an unhealthy, toxin-ridden gut. That is why Japanese traditional medicine recommends water therapy. By drinking water on an empty stomach, first thing in the morning, you can cleanse your stomach and support digestion. When you think about it, our bodies are made up of approximately 70 percent water. The same is true for the earth and nearly every other living organism. It’s clear that water is our natural lifeline, which is why you should ensure that you’re getting enough! At first, when switching from drinking little water to drinking one liter a day, you will likely experience a few unexpected effects. For example, don’t freak out if you gain a few pounds — your body is likely retaining water. It will soon adjust. Ready to improve your health without much effort at all? Here’s how you’ll body and mind will benefit. Hopefully, you’re not eating your lunch right now, because I’m about to talk about sludge. This is the build-up that accumulates in your colon over time. This is where nasty bacteria like to hide out. By cleansing the colon, you can loosen and expel this waste. In turn, you will not be able to absorb nutrients faster and more efficiently. Not only does water replace high-calorie beverages, but drinking more water will also support your metabolism. By increasing your caloric burn, you will experience what is known as diet-induced thermogenesis. Chugging back one liter of water will also help you stave off hunger cues so that you don’t snack on donuts all morning. Many people are not aware that they need water in order to support both blood and cell function. Approximately three-quarters of the water in your body is liquid inside cells. The rest is what’s known as extracellular fluid, including but not limited to blood plasma, lymph and the fluid between your cells. Unfortunately, even those who follow a clean, balanced lifestyle are still exposed to a wide range of toxins. However, when you drink ample amounts of water, your kidneys are able to properly filter and flush toxins. You will also soften your stool, promoting the removal of toxins through regular bowel movements. Since lymph is about 95 percent water, if you do not drink enough, lymphatic fluid cannot flow properly. This leads to what’s known as lymph congestion and in turn, the accumulation of toxic cellular waste. Instead of repairing and nourishing your cells, your lymph will start to damage and impair them. When you drink more water, you will feel the difference in terms of your mental energy and performance. As stated in one review, no matter how mild, dehydration impacts homeostatic function. This can lead to poor cognitive performance. In fact, being dehydrated by just two percent can have significant negative effects. Not only will your concentration, memory and attention suffer, but also your mood! If you are ready to improve immune function, increase energy, flush your bowels and so much more, it’s time to get into the routine of drinking one liter of water on an empty stomach. When you first awake, begin drinking immediately before brushing your teeth. Then, do not eat anything for the following 45 minutes or so. If you find it easier to work up to one liter, gradually increase your intake over the course of a week or so. Hey Buddy!, I found this information for you: "6 Amazing Benefits Of Drinking 1 Liter Of Water On An Empty Stomach". 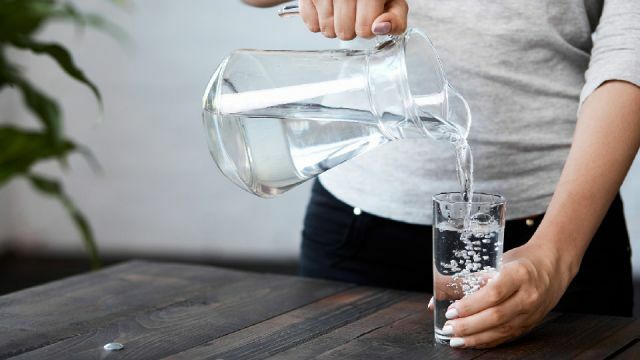 Here is the website link: https://www.thealternativedaily.com/6-amazing-benefits-of-drinking-1-liter-of-water-on-an-empty-stomach/. Thank you.